Stay current with a summary of, in our editors' view, the most important information added across our 22 specialties. Search specifically for graphics from the search box. 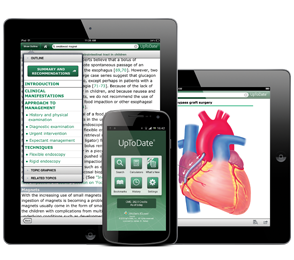 UpToDate contains more than 28,000 pictures, tables, illustrations, diagrams, videos, algorithms, and graphs. More than 160 calculators eliminate the need for you to remember formulas or use separate devices.